Veterans Day – Art's Musings, etc. Readers of my blog know that I love bicycling. I have never routinely driven a car to work or school. I’m in my 18th year as a professor at a big research university, and I’ve never had a parking permit on campus. I have the best parking space on campus, because I can wheel my bike into my office every day. I’m very lucky! 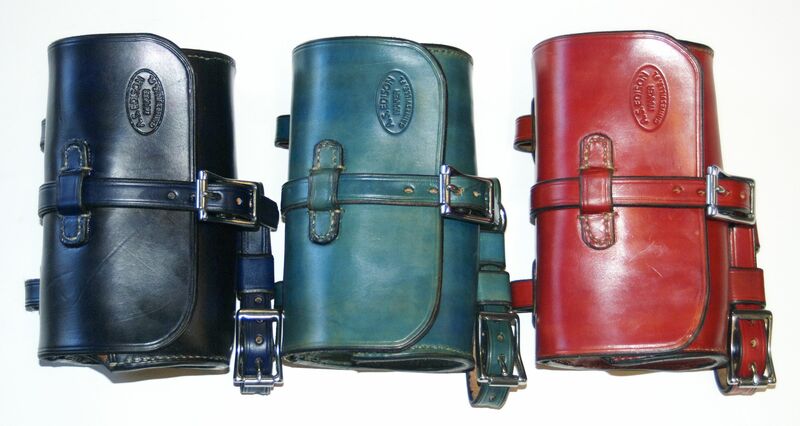 Front, or rear, large round bag. 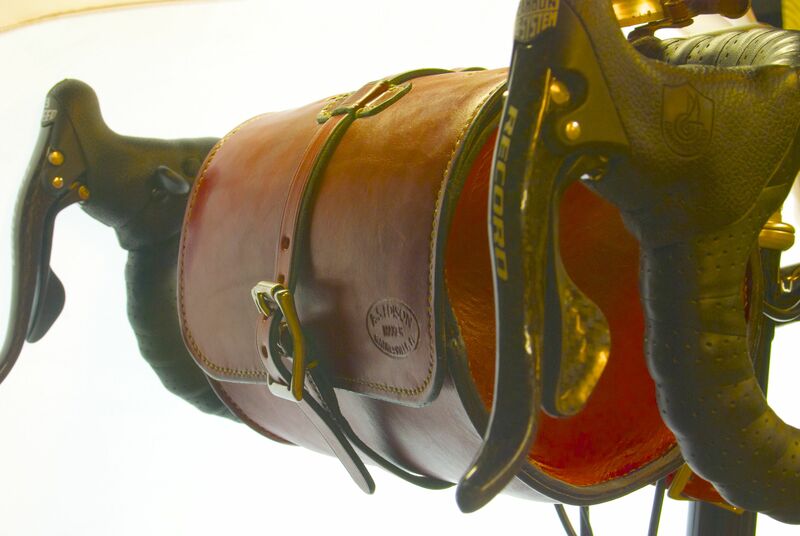 All hand stitched and hand made from the finest oak tanned cowhide. It is my love of bicycles that underlies my love of making bicycle bags. I love nice things that work really well and will last a lifetime. That is the essence of craft. I am not sure why I fell in love with bicycles, but it happened at an early age. My first major purchase as a teenager was an Azuki 10 speed when I was about 10 years old. I recall that I saved money for it from odd jobs and my parents put in the rest (probably most!). I took my first overnight bike trip when I was about 14 years old with my friend Tim on that bike: Salt Lake City to Orem to Park City. It was a great trip! 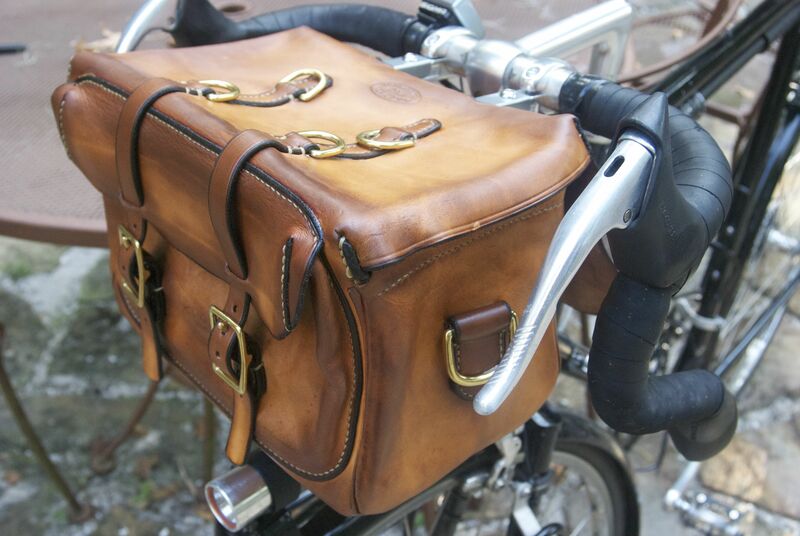 Touring style handlebar bag. All hand made, etc. When I was 18 years old, and in between high school, river running, and shoe repair, I decided to ride my bike across the country. The problem was that I had no idea what I was doing, and google had not yet been invented. So I contacted (by a real phone with a cord!) somebody from the local Salt Lake City bicycle club to find out how to ride my bike across the country. They told me that the best person to talk to was a guy named Dennis, who happened to live a few blocks from my house. Boy, were they right! 3 new bike bags. Isn’t color fun! 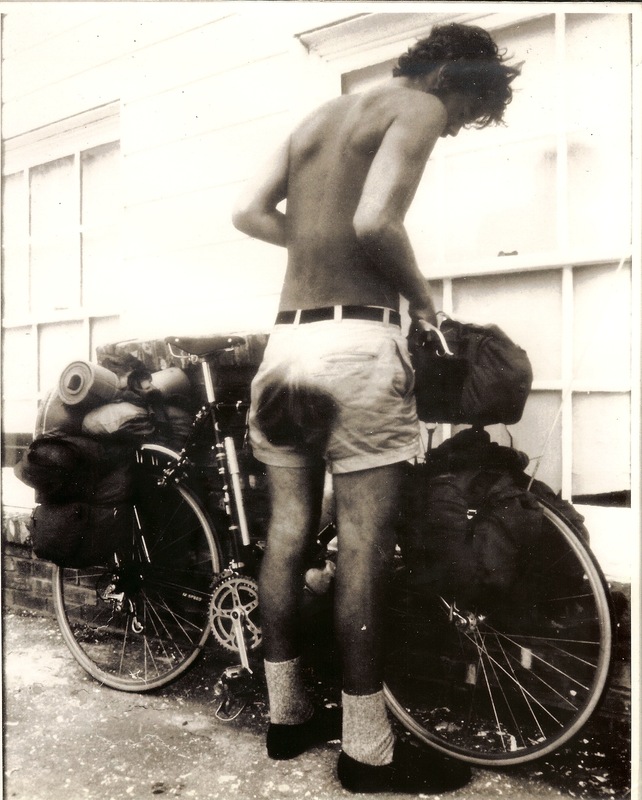 Den had ridden around the world on his bike, in addition to numerous less flashy trips. He also served 2 tours in Vietnam in the Army and volunteered for a 3rd before they told him that he’d had enough. Den and his wife didn’t own a car and used bicycles for everything: hauling lumber, groceries, commuting in the snow, dates, everything! What an inspiration they were! I contacted Den and told him that I wanted to ride my bike across the country, and he invited me to his house. We had a wonderful visit, and he agreed to teach me how to repair my bike and what I needed to do for a big trip. We had regular sessions to learn how to do everything on a bike to keep it going on the road. I trained with Den, his wife, and their friend. We took dozens of trips that were 40-80 miles long for a day, and we got to be good friends. After several weeks (or months? ), they invited me to go with them on their Lewis and Clark ride, scheduled for that summer. I jumped on it! A skinny Art in the middle of the Lewis and Clark Trail bicycle ride. The dark patch on my rear end is the black dye from the bicycle saddle. Photo by Dennis. What an amazing trip! It was 3000 miles, filled with history, headwinds, mud, and memories. It took 45 days to go from Astoria, Oregon to the Arch in St. Louis. It was something that I was very proud of and will always remember. One of the memories that stuck with me the most was in a small town in North Dakota on July 4. During the trip, we would camp for 3-4 nights and then get a hotel to clean up and relax. We decided that on July 4, we would get a hotel and rest up for a night. We got in about 4 or 5 in the afternoon, and Den and I walked to a small convenience store to buy some supplies. Another memory was even more intense and memorable. A year after the Lewis and Clark ride, Den and I were in Salt Lake City during the winter when we had a temperature inversion and horrible smog. We decided to jump on our bikes and ride to Southern Utah to get out of the awful air for a week. It was January and very cold. We made it out of the pea soup air on the first night and got below Provo before it was too dark, at around 5 pm. It got dark fast, and we were very cold, but it was still about 6 pm when there was nothing else to do but get into our sleeping bags and into the tent. This was way before cell phones, blogs, and facebook. We lay there together for probably 3-4 hours straight, trying to stay warm, listening to the howling wind, and talking about war, conscientious objection to fighting, and history (Dennis is an historian too). I was 19 years old and had just missed Vietnam by a few years. I had decided that I was a conscientious objector to war and refused to register for the draft. Den told me about his times in Vietnam and many occasions in the history of our country that men needed to fight and die for our freedom. You could not have put two more differing opinions into a smaller space, but we respected each other and listened to each other. I grew to have a deep reverence for men (and now women) who fought for our country. I also continue to feel that much of the fighting, especially during the past 10-20 years, is wrong and not the right way to solve problems. No matter how I feel about war, I am humbled that men and women are willing to lay down their lives for our country. On Veterans Day, go listen to some stories of people who fought in WWII, Korea, Vietnam, Iraq, Afghanistan. They are the heros that deal with messes that politicians seem to get us into. Thanks, Den.